Hand dryers are an important part of every washroom, allowing guests to dry their hands quickly and continue about their business. But gone are the days when hand dryers were noisy things that took ages to work and used a large amount of electricity every time. The modern hand dryer is much more energy efficient, allowing businesses to offer these facilities without costing a fortune in terms of electricity use. TWC Group offer services to install and maintain hand dryers in your business premises across the North East, Lincolnshire and Yorkshire. We can visit the premises and assess how many units you need based on the size of your washrooms. Then we can install energy efficient and quiet dryers that will quickly service your guests and keep electricity costs to a minimum. Our hand dryers also offer more than just energy efficiency. We have touch free models that are activated by place your hand under them. Not only does this stop the dryer running for a set time when no-one is using it, it also reduces the change of bacteria transfer as there is no actual contact with the unit. We use anti-bacterial systems to reduce the risk of any contamination gaining a foothold in the room. Paired with our odour control services, you can be certain that your washrooms are pleasant to use, have the most energy efficient facilities in it and that measures to stop the spread of bacteria and viruses are in place for your guests and your staff. Your local washroom hand dryer provider. 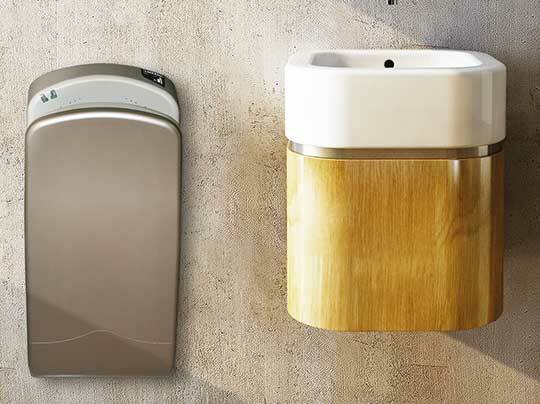 We provide our full range of washroom hand dryers across the whole of North Yorkshire, East Yorkshire, West Yorkshire and South Yorkshire, operating out of our locally based depots situated in Hull and Thirsk. Our washroom hand dryers in North Lincolnshire include our full offering and covers locations such as Scunthorpe, Grimsby, Brigg, Barton-upon-Humber and all the surrounding towns and villages across the Humber region. The washroom hand dryers detailed are available to customers located in the North East region, including cities such as Middlesbrough, Durham, Sunderland, Newcastle, Gateshead and all of the nearby towns and villages.